he Historic Filipinotown commemoration started with a bang, with more than 800 runners at its 5K Run in the morning and ended with a whimper with songs from a fading superstar from the Philippines. It was alas --a clash of two cultures and two worlds. On August 2, at the Historic Filipinotown Festival, while more than 600 Historic Filipinotown residents waited for hours for the Filipina â€œ Superstar â€œNora Aunor at the Historic Filipino town festival- another group of less than a hundred well-heeled academics and personalities held their affair in Remyâ€™s On Temple Art Gallery opened the 30-panel murals Smithsonian Exhibits-SINGGALOT. While more than 3,000 people at most participated in the Historic Filipinotown festival held on the streets of Historic Filipinotown, another group of students, academics and professionals oggled at the murals celebrating the centenary of the coming of Filipinos in America. The exhibit that highlighted the Filipino-American history from 1906 to 2006. The Smithsonian exhibits was first showed in Washington DC and will be exhibit at the Remyâ€™s on Temple Art Gallery until October 2008. Los Angelesâ€” The Historic Filipinotown commemoration started with a bang, with more than 800 runners at its 5K Run in the morning and ended with a whimper with songs from a fading superstar from the Philippines. It was alas --a clash of two cultures and two worlds. 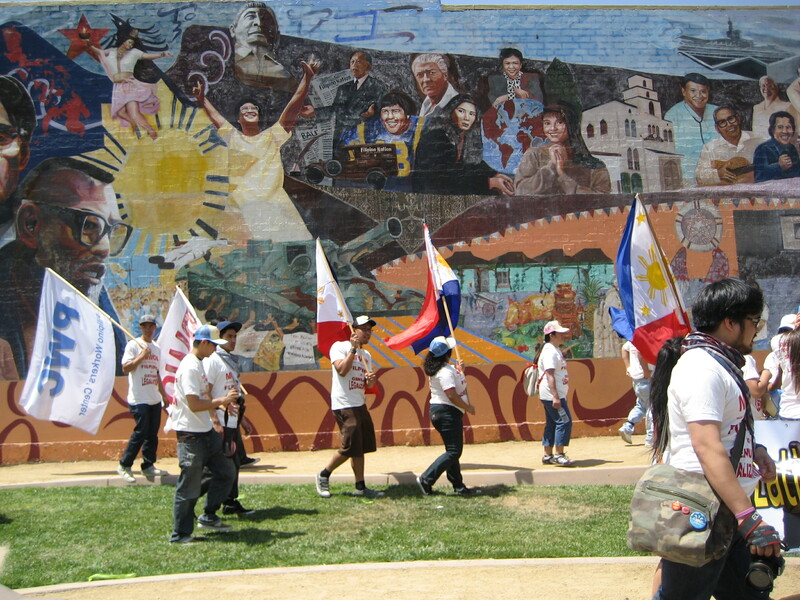 On August 2, at the Historic Filipinotown Festival, while more than 600 Historic Filipinotown residents waited for hours for the Filipina â€œ Superstar â€œNora Aunor at the Historic Filipino town festival- another group of less than a hundred well-heeled academics and personalities held their affair in Remyâ€™s On Temple Art Gallery opened the 30-panel murals Smithsonian Exhibits-SINGGALOT. While more than 3,000 people at most participated in the Historic Filipinotown festival held on the streets of Historic Filipinotown, another group of students, academics and professionals oggled at the murals celebrating the centenary of the coming of Filipinos in America. The exhibit that highlighted the Filipino-American history from 1906 to 2006. The Smithsonian exhibits was first showed in Washington DC and will be exhibit at the Remyâ€™s on Temple Art Gallery until October 2008. Seen as the largest crowd ever to attend the Historic Filipinotown Festival in its 6th year, more than 600 to 700 people mostly from the middle aged and senior citizens group patiently waited for the Filipino aging star-Nora Aunor who arrived late. La Aunor arrived at around 8:30 PM and swooned the crowd with Filipino songs. The crown started to wait from late 4:00 PM regaled by Latin dancing groups, music bands and singers. While the marginalized non-profits folded their tents as early as 5:00 PM, the loyal Aunor fans waited patiently feigning boredom during the festivities. The festivities ended after La Aunor waved goodbye. Meanwhile the Historic Filipinotown festival ended well- looking forward for another year.